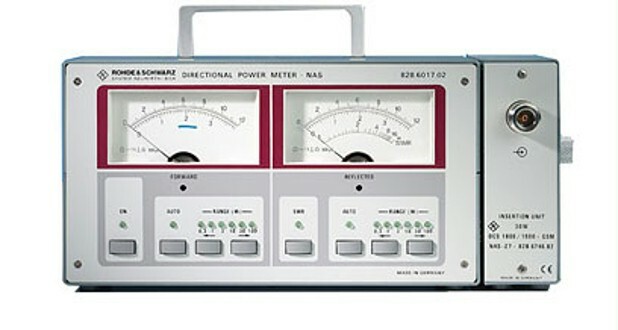 Directional Power Meter R&S®NAS is the ideal servicing unit wherever power and SWR of all kinds of radio equipment have to be measured. Insertion units for the whole field of mobile radio - including GSM applications - make the R&S®NAS a versatile unit and an investment for the future. Insertion units are either plugged to the side of the NAS or connected via a 1.5 m long cable for measurements at test points that are difficult to reach. Each insertion unit contains its individual calibration data which are read by the NAS and considered in the measurement results. Insertion Units NAS-Z6 and -Z7 measure the peak envelope power (PEP) of the clocked signal with due consideration of the timing laid down in the GSM specifications. The insertion units are ideal for measurements on mobile stations which according to definition are sending signals in only one of the eight timeslots. Transient overshoots of the signal bursts are eliminated by a signal-controlled circuit so that the forward and reflected power as well as the SWR can be correctly measured and indicated. The standard Insertion Unit NAS-Z5 with its wide frequency range is suitable for almost any application and practically covers all commercial analog RT services including air navigation. Insertion Units NAS-Z1 and -Z2 have been especially designed for the frequency range up to 30 MHz. NAS-Z2 is for powers up to 1200 W for use in long-range shortwave communication systems. For measurements on transmitters, a Termination NAZ10 or NAZ30 acting as a dummy antenna is connected to the output of the insertion unit. Operation of the NAS is extremely simple and reliable thanks to micro-processor control. Forward and reflected power or forward power and SWR are simultaneously indicated on two large meters. Indication of SWR does away with the cumbersome use of tables.